Allen Griffin was a versatile guard for Syracuse playing for four seasons. A small and quick player, he was a good ball handler and capable of playing both the point and shooting guard positions. As a freshman, Griffin was the primary reserve guard spelling Jason Hart and Marius Janulis when they needed rest in the game. Griffin played in all but one game that season. Griffin earned a starting position his sophomore season as the shooting guard. He was second in the team in three point shooting, and managed to do a good job at ball handling as the shooting guard. He would lose his starting position his junior season with the emergence of Tony Bland and Preston Shumpert, and the arrival of DeSean Williams, all of whom could play the shooting guard position. Griffin would instead focus that season on being the primary backup to the point guard position. Following the graduation of Jason Hart, Griffin would become the starting point guard for Syracuse his senior season. He would have a stellar campaign, proving to be very adept at running the offense, averaging 6.5 assists a game, and also scoring in double figures. He completed his career with a couple of outstanding efforts. He would accomplish the rare triple double in a win over Pittsburgh on February 27, 2001 with 14 points, 11 assists and 10 rebounds. 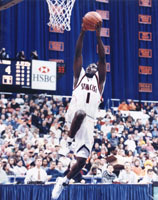 The next game, in a double overtime thriller at Madison Square Garden versus St. Johns, Griffin would play all 50 minutes and score 31 points leading the Orangemen to a 93-91 victory. Griffin would set a school record making 18 of 22 free throws in that game. Griffin would play professional basketball in the NBDL and in Europe after graduating from Syracuse. After graduating from Syracuse he played professional basketball in Europe (Slovenia), and in the United States in the USBL and NBDL (Asheville Altitude). He would return to Syracuse in 2003 as a administrative assistant for Coach Jim Boeheim, a position he held until 2005. In 2005 he became an assistant coach with St. Francis College (NY). He would be an assistant at other schools including Providence, Hofstra, and Dayton. Griffin would return to Syracuse in 2017 as an assistant coach under Boeheim.